The Toolkit contains the following practical and powerful enablers with new and updated Currency transaction report specific requirements:Step 1 get your bearings resources: The quick edition of the Currency transaction report Self Assessment book in PDF containing 49 requirements to perform a quickscan, get an overview and share with stakeholders, plus an example pre-filled Self-Assessment Excel Dashboard to get familiar with results generation. Step 2 set concrete goals resources: Featuring 670 new and updated case-based questions, organized into seven core areas of process design, this Self-Assessment will help you identify areas in which Currency transaction report improvements can be made. 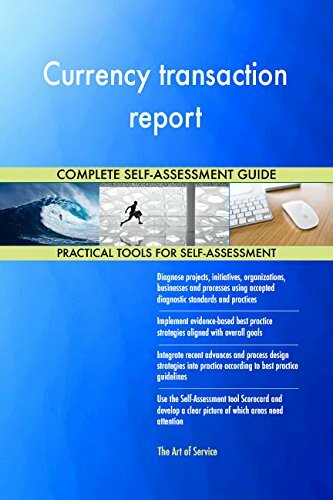 The workbook contains 670 requirements, which criteria correspond to the criteria in the Self-Assessment Excel Dashboard; you will develop a clear picture of which Currency transaction report areas need attention, which requirements you should focus on and who will be responsible for them. Step 3 implement and track resources: The outcomes of Step 2, the self assessment, are the inputs for Step 3; Start and manage Currency transaction report projects with the 62 implementation resources: 62 step-by-step Currency transaction report Project Management Form Templates covering over 1200 Currency transaction report project requirements and success criteria. With this Three Step process you will have all the tools you need for any Currency transaction report project with this in-depth Currency transaction report Toolkit. In using the Toolkit you will be better able to diagnose, implement and integrate Currency transaction report projects, initiatives, organizations, businesses and processes using accepted diagnostic standards and practices. 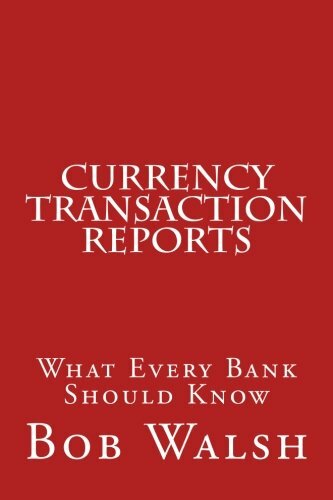 This book provides a detailed review of currency transaction reports and ielated processing and compliance. A widely regarded authority in this field, Bob Walsh has also authored a full series of texts covering AML and KYC compliance and related auditing. He has worked on some of the largest AML and KYC cases in U.S. banking history. Mr. Walsh continues to assist banks and major consulting agencies. This book is a must for all AML/KYC audit and compliance staff whose responsibilities include Currency Transaction Reports (CTRs)! This book is one in a series of extraordinary guides in which Bob Walsh details the function and operation of key financial services for the benefit of AML/KYC audit and compliance professionals. The author is convinced that providing a greater understanding of the inner workings of how CTRs and other financial services operate can dramatically strengthen AML/KYC compliance and audit results. 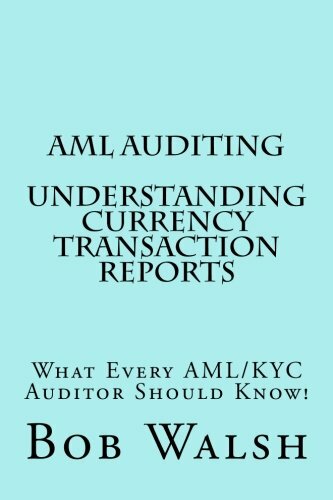 All of Bob Walsh’s AML books for auditors also address the complex world of money-laundering, related AML/KYC issues and concerns, AML/KYC acronyms and technical glossary, and a list of currently known terrorist groups. The CTR topics described in this book include background and history of CTRs, structuring of transaction, due-diligence research, Suspicious Activity Reports (SARs), Know Your Customer requirements, politically exposed persons, “311” and “314” entities, and more. The material contained in Mr. Walsh’s books was compiled from over 30 years of hands-on experience in the U.S. and international banking industry. He is a CAMs certified AML/KYC compliance specialist who has worked with some of the largest banks in the world, the Federal Bureau of Investigation, the Federal Reserve Bank of New York, and major AML/KYC consulting agencies working on some of the largest AML/KYC cases in banking industry. As one of the leading authorities in the field, Mr. Walsh continues to assist banks with AML/KYC compliance investigations and related AML/KYC technical training. His office is located in New York; he may be contacted by email at: walsh516@aol.com. The War on CashPowerful forces are threatening your financial freedom. All over the world, including in the United States of America, governments, certain academics, banks and non-governmental organizations (nonprofits) are working in a coordinated way to stop you from using cash. They want you to have no option but to pay for everything you buy using electronic payment systems. They want you to be unable to go to a bank and withdraw your money in cash. They want you to be afraid to have more than a few dollars cash on your person, in your home, or in your car.Laws have already been passed in Europe and the United States to restrict the use of cash for certain things. Banks are beginning to adopt policies against keeping cash in a safe deposit box, or paying bills with cash. Legitimate businesses and their employees are being cut off from the banking system because their customers usually pay in cash, or because the businesses sell a legal product or service that the government does not approve of.The IRS is seizing bank accounts of people and businesses who have done nothing wrong except make regular cash deposits of less than $10,000 to their bank account.Law enforcement officers are seizing cash from anyone they think is carrying too much cash. If you have more than a couple of hundred bucks on you, you may be suspected of being a drug dealer or a terrorist. No drugs or bombs need be in your possession. The cash is the evidence. 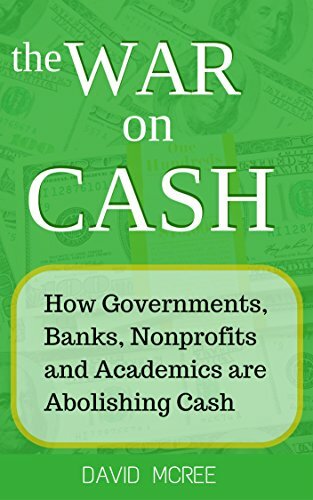 In this book, The War on Cash, I have five goals:To show you that the planned attacks on your natural rights as mentioned above are actually happening and getting worse;To convince you that the use and possession of cash is essential to a free and prosperous society;To show you that these attacks on your cash and your privacy are not isolated events, but are representative of a worldwide trend that is effecting everyone and involves billions of dollars;To show you that unless something is done, there is a high likelihood that you will lose the ability to use cash in your lifetime or you will be persecuted for your use of cash;And finally, to suggest how you can fight back.This book is intended to be a wake-up call to anyone not familiar with the tactics being used by governments to restrict the public's use of cash and to abuse the laws for its own purposes.In the book I write about laws being passed to restrict the use of cash. I introduce you to Ivy League academics who are influencing governments to abolish cash. I explain how a network of richly funded nonprofits are operating to discourage the use of cash. I explain civil asset forfeiture and Operation Choke Point and give many examples of how ordinary Americans are being victimized by the US government. I discuss inflation, how it is created, and how it affects your cash. I explain how the banks and the government are working together to put the squeeze on your use of cash. I think you'll find the chapters on the IRS and its battle against the underground economy enlightening, and I have some thoughts about hiding cash, transporting cash, and how you can fight back in the war on cash.Get informed NOW by scrolling up and clicking the "Buy" button. This book is a must for all AML/KYC audit and compliance staff whose responsibilities include Currency Transaction Reports (CTRs)! This book is one in a series of extraordinary guides in which Bob Walsh details the function and operation of key financial services for the benefit of AML/KYC audit and compliance professionals. The author is convinced that providing a greater understanding of the inner workings of how CTRs and other financial services operate can dramatically strengthen AML/KYC compliance and audit results. 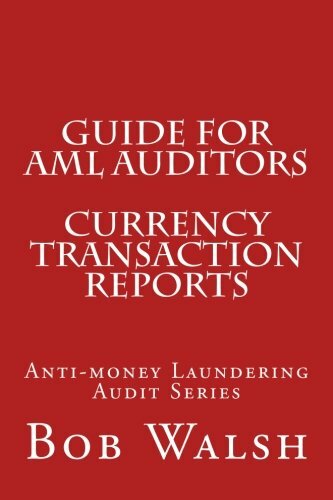 All of Bob Walsh’s AML books for auditors also address the complex world of money-laundering, related AML/KYC regulatory issues and concerns, AML/KYC acronyms and technical glossary, and a list of currently known terrorist groups. The CTR topics described in this book include background and history of CTRs, structuring of transactions, due-diligence research, Suspicious Activity Reports (SARs), Know Your Customer (KYC) requirements, politically exposed persons (PEPS), “311” and “314” entities, and more. The material contained in Mr. Walsh’s books was composed from over 30 years of hands-on experience in the U.S. and international banking industry. He is a CAMs certified AML/KYC compliance specialist who has worked with some of the largest banks in the world, the Federal Bureau of Investigation, the Federal Reserve Bank of New York, and major AML/KYC consulting agencies working on some of the largest AML/KYC cases in banking industry. Mr. Walsh assists banks with AML/KYC auditing, investigations, compliance assessments, remediations and related AML/KYC technical training. He resides in New York, and may be contacted by email at: walsh516@aol.com. On October 26, 2001, the President of the United States signed into law the Uniting and Strengthening America by Providing Appropriate Tools Required to Intercept and Obstruct Terrorism (USA PATRIOT ACT) Act of 2001, Public Law 107-56. 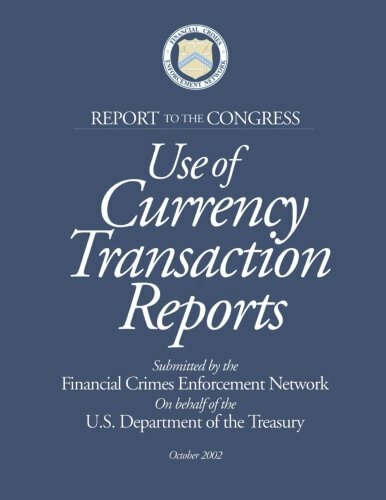 Section 366 of the USA PATRIOT ACT requires the Secretary of the Treasury to conduct a study regarding the system for exempting bank customers from currency transaction reporting under 31 U.S.C. 5313.